Senator focuses on November elections, says talk of impeachment is premature. WASHINGTON — Sen. Mazie Hirono (D-Hawaii), a member of the Senate Judiciary Committee and an opponent of President Trump’s nomination of Judge Brett Kavanaugh to the Supreme Court, made the following comments on ABC’s “This Week” on Oct. 7 following the Senate’s confirmation of Kavanaugh, who was immediately sworn in as an associate justice. Jonathan Karl, ABC News: You called this process a sham. He is now Justice Kavanaugh. Do you view Justice Brett Kavanaugh as a legitimate justice? 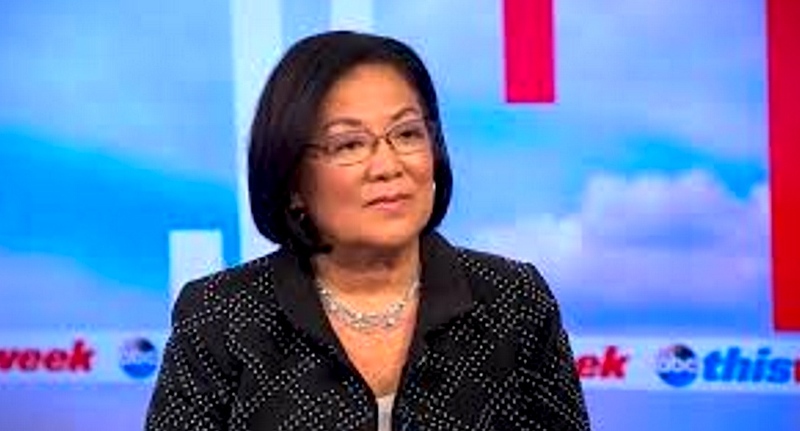 Hirono: He’s going to be on the Supreme Court with a huge taint and a big asterisk after his name. And the partisanship that he showed was astounding. And the conspiracy theory that he accused us of behaving in was bizarre. So prior to his testimony I had already decided, having gone through all his record and his dissents that there was a pattern which showed that he was not for women’s reproductive choice, that is sure. And a number of other patterns that were very troubling. And I had already decided. Hirono: I’m totally focused with all the angry women and the men who listen to women and support the credible accounts of sexual harassment and sexual assault, which is very under-reported, that I’m focused like a laser beam on the elections. Hirono: So, you know, I view so many of these things as basically — Jon, I don’t blame you for wanting to ask these questions because I know as you tried to talk to Kellyanne [Conway], it’s really hard to get a word in edgewise with her. But with this whole impeachment thing, you know what, I’m very focused on the here and now, which is that all of these very angry women, mainly, out there who saw what was going on and how the Senate was not able to deal fairly with the entire issue of sexual assault, clearly this idea that Dr. [Christine Blasey] Ford was given, you know, all accommodation is really, I have to say, baloney. Hirono: I’m much more focused on what we need to do which is we need to get to the polls, truly. Karl: Yes, but do you approve of those tactics, whether they’re — whether it’s the Tea Partiers or whether it’s the resistance? But people feel very strongly. That’s what happens in our country. People felt very strongly about the Affordable Care Act back then. Karl: Sure. Let me ask you about what [Senate Majority Leader] Mitch McConnell had to say about all of this … So was this a political mistake? You lost the confirmation battle. He’s on the Supreme Court, and now all the indications are Republicans are more energized than they were two weeks ago. Hirono: Because I actually studied his cases and I read his — particularly his dissents, which are very telling, very much against reproductive choice. So it doesn’t matter to me, frankly. Yes, of course it matters if they go over there and actually overturn Roe v. Wade, which I doubt they’re going to do. But as Kellyanne said, the states are very busy passing all kinds of laws that would limit a woman’s right to choose. It’s those things that will go before a justice. Hirono: Even if they don’t … they will nullify it, pretty much.